Boxes for print and usb made of wood or polypropylene. Open the Rewind the Happiness box and enter the movie of your life, rewind the tape to go back to these happy moments, to see the eyes of who helped you grow, to the scents of people you fell in love with, and linger on the moments in time that gave sense to your life and became part of its poetry. 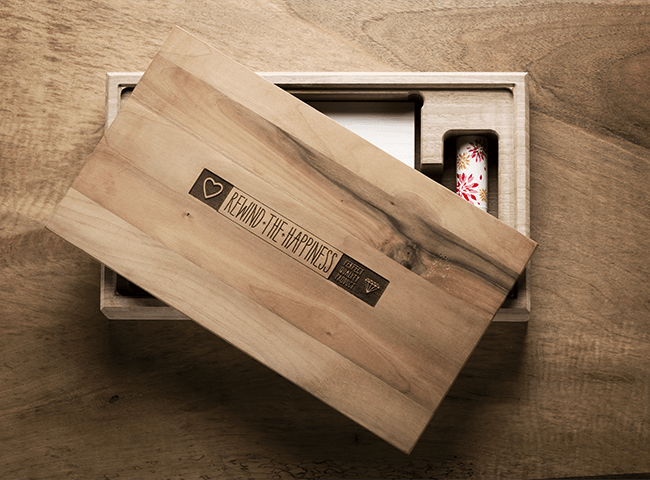 The Rewind the Happiness box is almost a sculpture, a minimalist design with a warm heart, an entire piece of hazelnut or oak wood that’s been drilled out to create the perfect place for your Fine Art Prints and a flash drive. At the top, the text “REWIND THE HAPPINESS” is engraved with a laser, but this can also be personalized. A quality choice, intimate, essential, emotional. The Print Box is an elegant solution for your Fine Art Prints. Light, versatile and modern, it fits in perfectly with the warm and sophisticated Fine Art papers that combine with it perfectly. Made of Polypropylene (PPL), you can choose between the semi-transparent (Frost) or opaque white (Milk) version. Available in small dimensions and as single copy. Small, Medium and Large versions can be personalized. The exterior of the box is finished with an original, decorative elasticated band.